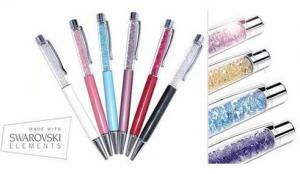 A Swarovski Crystalline ballpoint pen crafted in a 18K yellow gold-plated body, with 540 crystals. Plus other 5 colors for you to choose. Personal checks to suit any personality - at a fraction of what many banks charge. Their entire collection includes over 250 personal check designs - find the design that best fits your style. A resolutely contemporary statement in all-metal design, The IM's tapered shape combines comfort, simplicity and accessibility. Choose from a wide range of high-quality finishes to match any mood. 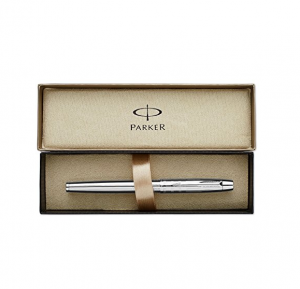 Stainless steel nib provides superior resistance and durability, and is designed to provide optimal writing angle for right- or left-handed writers. Shiny chrome metal enhanced with a chiselled motif reminding a sequence of rings. 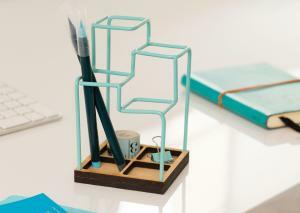 Suddenly Have a Brainwave at Work When You Touch These Office Desk Organizers! Oh that messy desk! It's sapping your creativity, messing up your workflow and just generally cramping your style! Having a neatly organized and functional desk would reduce work stress and give a better impression to yourboss and colleagues. 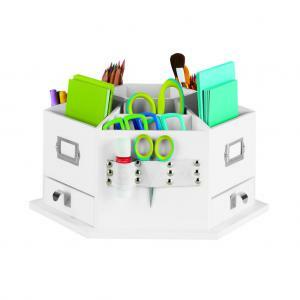 So an organizer is a must-have. However, getting a desk organized is usually easier said than done. Lucky for us, there are many cool products that will not only add a touch of style to your workspace, but also make it fun for you to keep your desk clean and organized. These little gadgets are the all-in-one solution to all that clutter. Pick one up and you'll be scarily organized in no time. Pepp is an unusual laser cut plywood pen holder. 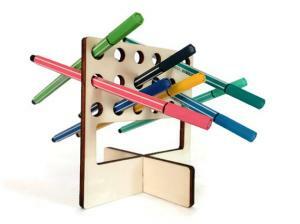 This pen storage can be positioned either vertically or horizontally. 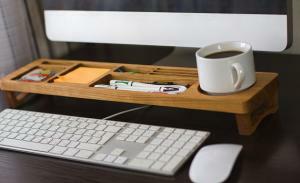 The dimensions of the desk organizer are 128x106x128 mm. It's allowed to be customized with hand painting or to leave the natural wood finish. The colors available are poplar-natural wood,light walnut,dark walnut, wenge, black, white, gray, yellow, red, red bordeaux, orange, dark blue, cobalt blue, light blue, light green, lime green, green, mint, teal, turquoise, fuchsia, pink, purple, brown. All-in-one docking station for your husband, parent, or just a friend. This dock station is compatible with all smartphones, including iPhone 6s and Samsung S7 edge. 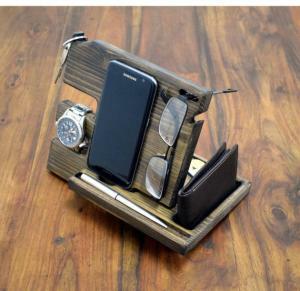 It is designed to keep items organized in one stand. No more forgetting where you put your daily life items that you carry such, your phone, wallet or keys. Organizer for your desktop — very useful thing. After a good half success depends on the order in the workplace and quick access to essential facilities. Brilliant ideas, thoughts, decisions should be recorded on paper immediately after they have occurred. How can this be done if the pencil rolled under the keyboard, and paper records accidentally fell on the floor? Any delay and the idea is lost. The organizer for the desktop — the product of long and hard work. Not only manual, but mental. They tried a variety of sizes of offices. Sent samples to check the usual office employee and took into account their requirements, comments and suggestions. In addition, You get a stylish accessory that best fits the interiors of any workplace. This product can be a great gift for an employee, supervisor or family member not only for office use but also for home workplace. 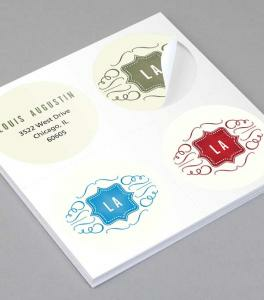 These customizable, round stickers are agreat way to brand your business, label gifts or include on marketing materials. You can customize them on MOO by uploading your own design, using one for their templates or starting from scratch using their design creation tool. You can add photos too! Right now you can save 10% on these round stickers when you use the promo code SAVETEN during the checkout process. A scented candle is a must have at the office especially when you constantly stressed out. 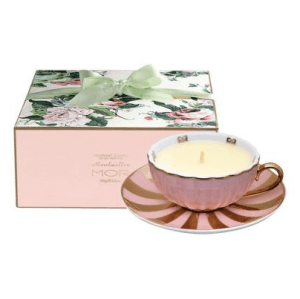 This wonderful scent candle can help you relax and de-stress the mind and body. Presented in a beautiful, keepsake decorative tea cup. The Fragrance: Marshmallow is collectively orchestrated with Vanilla Musk and Jasmine Flower that gloriously rapture in this pretty, feminine fragrance. Sugar dipped Rose petals with White Carnation and Cotton Candy play beautifully to create a deliciously sweet perfume. The Stainless King series creates a new chapter in Thermos' storied history with a modern line that blends our newest technology with a dash of the past. The Stainless King Food Jar has TherMax double wall vacuum insulation for maximum temperature retention, hot or cold. The unbreakable stainless steel interior and exterior keeps drink cool to the touch with hot liquids and sweat proof with cold liquids. 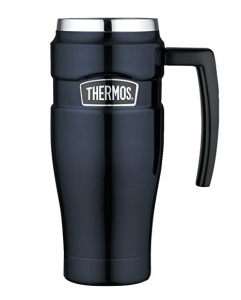 The Leak Proof Mug with handle has a Capacity of 16-ounce/.47L. Free shipping with standard shipping selected. Discount does not include shipping and cannot be combined with any other offer, MBS or gift card. Cannot be combined with any other offers. Does not apply to gift certificates or gift cards. Does not apply to shipping costs. Prices as marked. See the merchant's website for more details. Discount is for cheapest shipping method only and cannot be combined with any other offer, MBS or gift card. For new customers only. 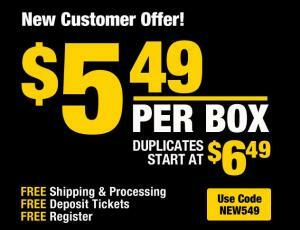 Discount does not include shipping and cannot be combined with any other offer, MBS or gift card.